FlowGuard Gold® CPVC vs. Generic CPVC | Lubrizol Advanced Materials, Inc.
Not all CPVC compounds, however, are the same and only a complete FlowGuard Gold piping system will provide the consistency and durability you’ve come to expect from FlowGuard Gold CPVC. While it is true that generic CPVC materials can save a few pennies in the short-term, the long term liability cost can wash out any immediate savings. Since 1959, FlowGuard Gold CPVC has been held to the highest standards of excellence. To confirm our superior performance, Lubrizol conducted physical testing on both FlowGuard Gold fittings and generic fittings produced on the same equipment by the same manufacturer. FlowGuard Gold CPVC fittings outperformed generic fittings in all sizes and geometries tested. Fitting performance is an important part of the story, but system performance relies equally on using high quality pipe and fittings. To help evaluate the performance of FlowGuard Gold pipes compared to our competitors, we sampled all of our licensed manufacturers’ and competitors’ pipes and put them to the test. In both impact strength and sustained pressure resistance, all of the generic pipes tested performed significantly lower than the FlowGuard Gold pipes tested. When subjected to excessive temperature testing, FlowGuard Gold pipes were the only samples that did not immediately fail. Generic CPVC manufacturers either source their resins and compounds overseas (more than 85% of non-Lubrizol CPVC resins come from in Asia) or source their resins from one company and compound them in a separate facility before sending the finished product to the pipe manufacturer. While generic CPVC pipe and fittings manufacturers may mix and mingle their resin and compound sources, resulting in inconsistent products from one batch to another, the compounds used to make FlowGuard Gold CPVC materials are made from Lubrizol’s own resins with both the resin manufacture and the compounding process occuring in the same plant, under Lubrizol’s control, in Louisville, KY.
Tens of billions of feet of FlowGuard Gold CPVC piping systems installed globally during the past 60 years attest to FlowGuard Gold CPVC piping quality, consistency and reliable long-term performance. Lubrizol’s manufacturing partners each offer a warranty on their own pipe and fitting products, but contractors and builders can also work with Lubrizol to qualify for Lubrizol’s Preferred Contractor Program, which would allow qualified contractors and builders to offer an additional warranty on the plumbing system, backed by Lubrizol, to their customers. Introducing non-FlowGuard Gold CPVC components to a plumbing system places your warranty protection at risk. Lubrizol’s warranty does not cover failures of generic CPVC systems or components within a system. When contractors mix generic fittings or pipe with FlowGuard Gold CPVC during installation, they not only introduce underperforming components to the system, but they may undercut their warranty protection on the system. While generic CPVC clearly comes with lower performance, it also comes with a lower price. Most business owners are savvy enough to understand the risks associated with this tradeoff and insist on a complete FlowGuard Gold system. Unfortunately, in the field, it is possible for generic CPVC products to pop up at distribution and make their way onto your jobsites. To ensure the quality of product on your jobs it is important to verify your products prior to installation. FlowGuard Gold pipe can be easily identified by inspecting the print line for the trademark gold stripe and “FlowGuard Gold®” mark. You can identify the specific Lubrizol manufacturing partners as well through their brand name on the pipe. Fittings can be a bigger challenge to clearly identify and, as a result, there is a much higher risk of contractors unintentionally mixing in generic fittings and diminishing the quality of their installations. 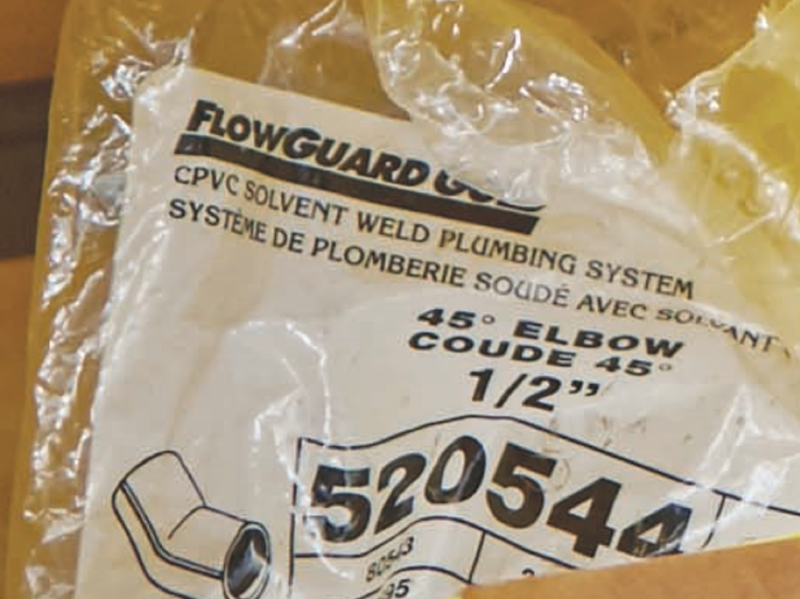 Contractors who purchase fittings in bulk can verify those fittings by looking for the FlowGuard Gold logo on the packaging. If the packaging does not have the FlowGuard Gold logo – the fittings are not FlowGuard Gold CPVC. If you’re buying fittings outside of their original packaging – or inspecting your inventory to weed out non-FlowGuard Gold fittings – you can also look for markings on the fitting itself. 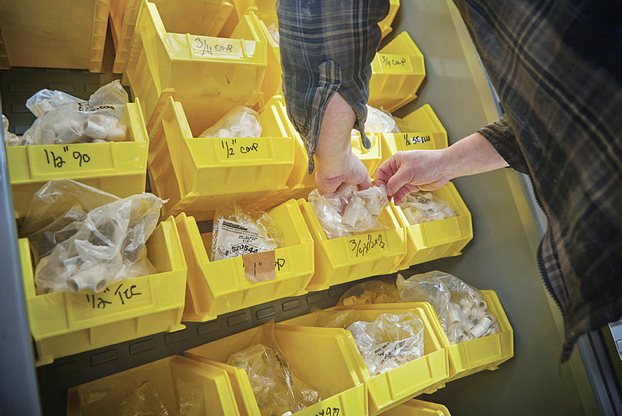 Common generic CPVC fittings include Spears, KBI and Lasco brands, along with a variety of Asian brands, which occasionally pop up in distribution. These brands are not made from FlowGuard Gold CPVC and should not be installed as part of a FlowGuard Gold CPVC plumbing system. If you run into a distributor offering unusually low pricing on CPVC fittings (in some cases as much as 50% lower than FlowGuard Gold fittings) don’t be fooled – tell your distributor you insist on FlowGuard Gold CPVC fittings. A few pennies saved on the invoice are not worth the risk you’ll be adding to your system. FlowGuard Gold CPVC is America’s oldest and most proven non-metallic piping system. Only FlowGuard Gold CPVC offers the assurance and consistency of product that comes from being made with resins and compounds produced in the same plant under Lubrizol’s control in Louisville, KY. With 60 years of proven history, more than 11 billion feet of FlowGuard Gold CPVC have been installed in American homes and businesses. FlowGuard Gold CPVC pipe and fittings are the choice of contractors who value quality products and depend on them for reliable, long-term service. Contact us to speak to a representative and learn how to make the switch to the superior plumbing system.